Don't get me wrong - I love autumn - it has the biggest and brightest skies of any season. The mere thought of the fall season evokes a peaceful resting time - a respite from the busy summer. And as the days grow longer autumn ushers in crisp, cool weather - and so begins my issue with autumn - the cold. In truth, it's not the cold I oppose, but rather the heat, the drying heat of the house furnace - sucking every drop of moisture out of the air, and out of me! I'll do anything I can to delay the start of that furnace - my husband compares our home to a meat locker. Well this morning when the bedroom struck 53 degrees there was no holding back - on with the furnace! It may be turning cold outside but this collection from Art Gallery Fabric says anything but cold. Art Gallery is a relatively new fabric manufacturer to the market - and Pat Bravo is the creative force behind its success. 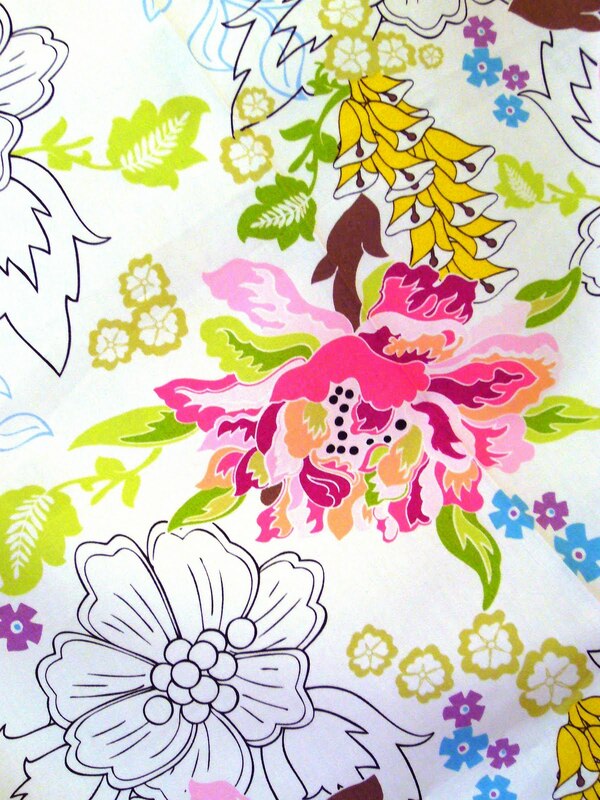 Here is a taste of one of her collections - Paradise - the designs are beautiful! 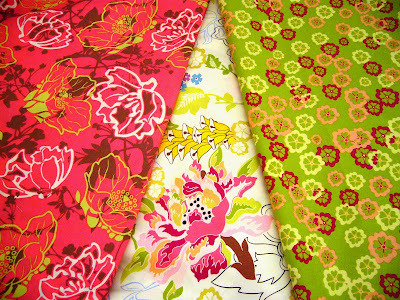 Here it is paired up with two of the companion fabrics - intense color saturation. 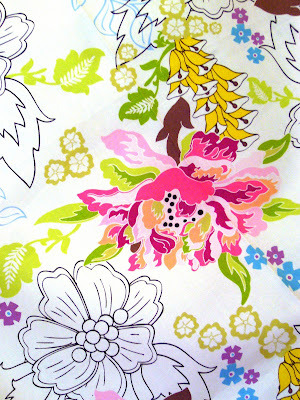 And what you can't see is what your hands need to touch - the hand of this fabric is exceptional - sateen-like, dreamy! "Feel the Difference" - it says so right on the selvedge! The selvedge can tell you more - look at all of the colors in this one design - the sign of a first rate fabric. Now I had to invite some solids to this garden party - notice a resemblance between the selvedge dots and my solid fabric choices??? My only issue here is fabric quality - the Art Gallery fabric is so luxurious that I'm concerned my solids will detract from the overall feel of the quilt. We quilters really need to demand a serious line of high quality solid fabric. Hmmmm - wonder if we can talk them into a line of solids??? Hope the folks at Art Gallery are listening in! 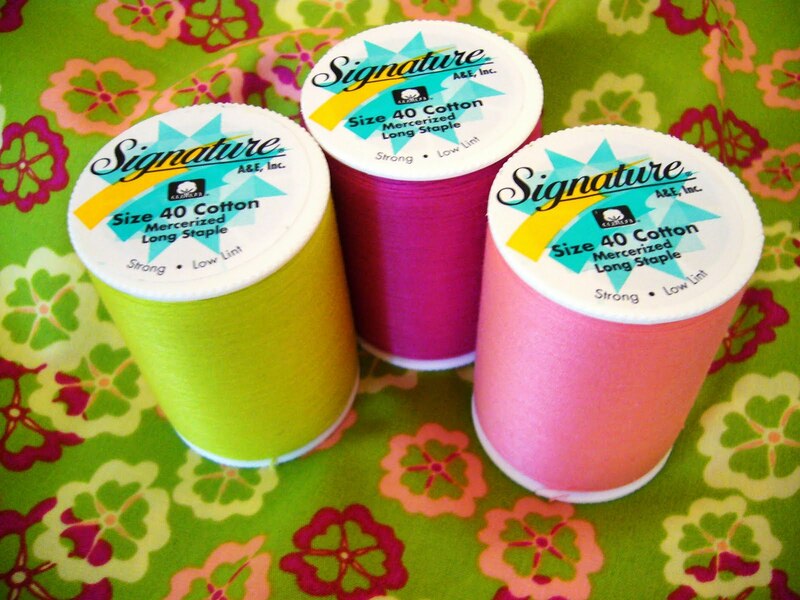 In addition to fabric Pat has also designed a line of thread for Signature Thread - the colors are fantastic! 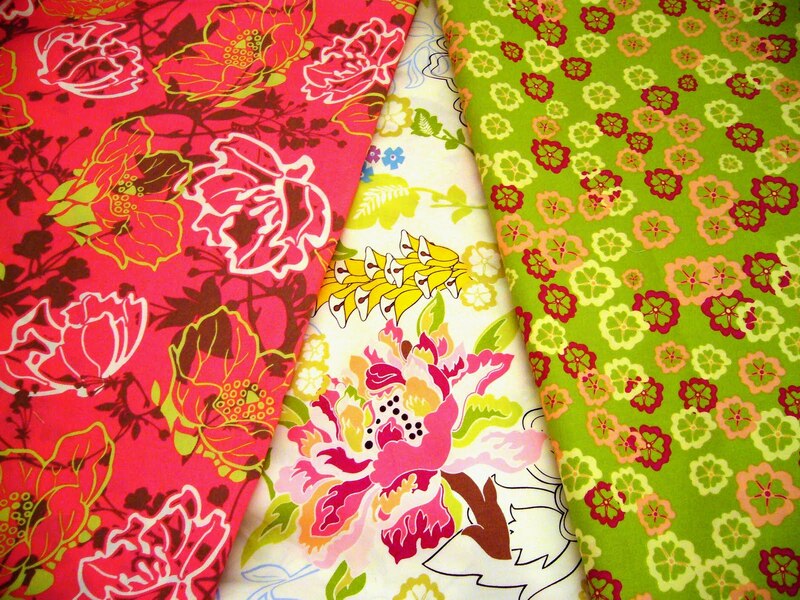 These three are going to look beautiful with my project - it involves lots of top-stitching! 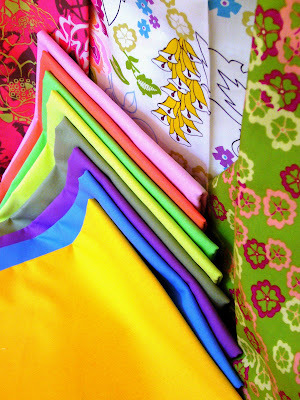 If you haven't seen the Art Gallery Fabric Collection you don't know what you're missing. I've seen it in many quilt shops locally - check with your favorite quilt shop - if they don't have it, ask them to give it a try!